We’re proud to announce the recent partnership with X-Cart. X-Cart is a pioneer in the E-commerce industry. Their platform exceeds the expectations of stability, speed, efficiency, & ease of use. We will be able to offer the ability to start a marketplace similar to Amazon on a very stable platform that has the capabilities to perform well under heavy conditions. 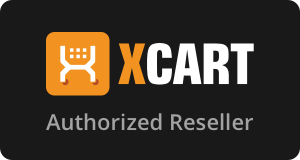 We expect to fill the X-Cart marketplace with additional themes and high-quality extensions. Furthermore, we will be able to assist in the setup of the platform from start to finish. For business owners, there’s nothing more time consuming and aggravating than an e-commerce website that just won’t stay running. X-Cart’s long years of efficiency improvements have made them one of the most stable e-commerce platforms in the industry. The platform was founded in 2001, from that time the X-Cart team has worked on increasing the quality of an already high-quality platform. The underlying framework of X-Cart is also a powerhouse. X-Cart was built on the Symphony framework which is also a pioneer in its own industry. X-Cart has a conversion beast called X-payments. The X-payments system allows for your customers to save credit cards. For repeat customers, It takes away a few steps from the checkout process resulting in higher conversion rates. X-payments supports major credit card processing platforms to boot. How often have you tried to find a mobile application for your e-commerce store? X-Cart solves this problem by also offering a mobile application to match your website which is competitively priced. Compared to Magento, the underlying framework is extremely stable. Let’s think about this for a second. The Symphony framework went through years of improvements to get to the stable state that they are and so has X-Cart. Magento has re-created their framework so technically, in my opinion, it would take a few years for the new Magento framework to be as stable and efficient as the Symphony framework & X-Cart. With a number of malicious attacks on e-commerce websites, stability is the most important. If you’re interested in switching your current e-commerce platform to X-Cart, click here.